Portugal - September 21, 2018 15:00Futsal Coaching: Decision-Making ProcessStudy by João Almeida & Bruno TravassosHere you can read an extract from a futsal study released by João Almeida (Futsal Technical Director & Head Coach at The International Futsal Academy) and Bruno Travassos. Have a read! 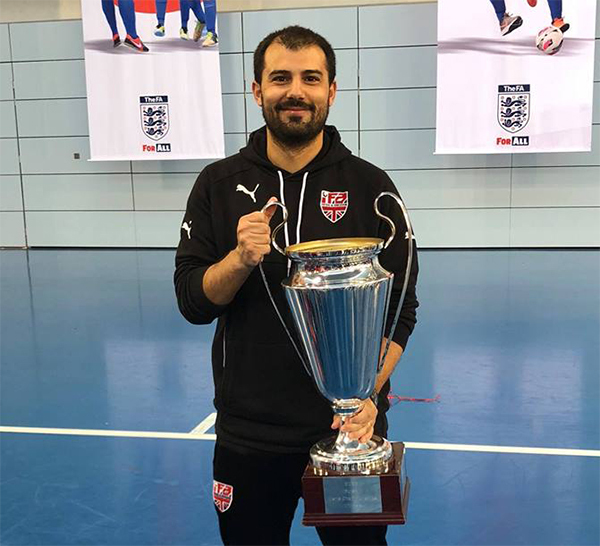 With the main goal to develop new tools for Futsal Coaches, it was developed one research to increase their effectiveness in the decision-making process. Here, in abstract form, we present a generic view of the results and study. Our research aimed to identify the most common problems that coaches need to deal with in the game preparation and in game moment. For that, ten professional expert Futsal Coaches from different countries were interviewed to identify the strategies that sustain assertive thinking patterns and fast decision-makings. Over the interview we intended to (a) characterize coaches’ preparation for game momentary actions; and (b) identify the most relevant issues for coaches’ decision-making during the games. 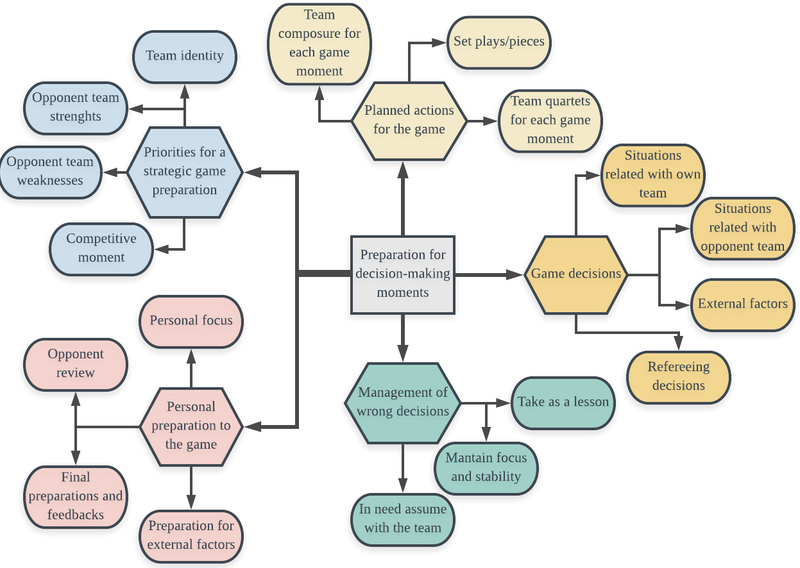 On the preparation of the game the coaches consistently reported the need to consider 5 dimensions: 1) Priorities for strategic game preparation; 2) planned actions for the game; 3) personal preparation; 4) game decisions; and 5) management of wrong decisions (see Figure 1). 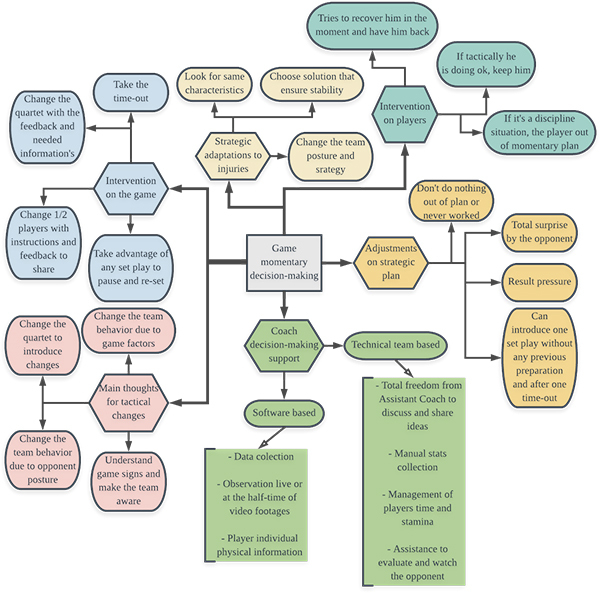 Intervention on the game; 2) Intervention on players; 3) Main thoughts for tactical changes; 4) Strategic adaptations to injuries; 5) Adjustments on strategic plan; 6) Coach decision-making support (see Figure 2). The main objective of this study was to identify the most common problems that coaches need to deal with in the game preparation and in game moment. From a generic point of view, we conclude that coaches always look to the actual capabilities of their team as part of a development process to potentiate the collective behavior of the team. To do this, coach effectiveness based on a vision of team development is paramount to align and promote interpersonal relations between players. Increasing players competence, confidence, connection and character, are goals that coaches need continuously seek. The investigation also highlights that lifelong learning is a key issue for team development. Almost of coaches sustained that mistakes can be used for learning purposes and to develop new knowledge related with the game development. Such results can contribute to improve the coaching education programs, introducing the learner’s perspective with information regarding the coaching effectiveness (Trudel, 2009), but also helping to modulate the capital behaviors of elite futsal coaches (Borrie & Kowles,2003). At the end, the results revealed that more than pre-determined decisions, expert coaches made situationally meaningful judgements and explore in a pragmatic way the most relevant constraints of game and training environment (Cushion et al.,2003). It allows to explain the difference on behaviours and reactions of different expert futsal coaches. Each one read the performance context and the futsal game based on their one beliefs and aligned with a vision of team. This study follows Cushion (2006) vision. That is, coaching development programs should support the idea that future coach education programs should potentiate the capacity to continuously manage and improve the factors that constraint the athletes and team performance. This study helps to systematize the identification of the factors that support the preparation and the decision during game performance, allowing coaches to be more conscious about their own competences and skills. In our main study it’s possible to observe a full analysis for each dimension of study, exploring the reasons and goals of each prioritized possibility for decision, helping Coaches’ to choose better, react faster and become more effective in the decision-making process.